The astronomical observatory of San Vittore lies near Bologna in Saint Vittore, approximately 3 Km from the center of the city, in the south, at the altitude of 280 meters, near a splendid oratory of the XI - XII century. Today (July 2007) the structure, which such exists, was permanently closed more than a year ago. I believe we can surely assert that Saint Vittore has been one of the rare observatories built and managed by amateur astronomers that has carried out research continually on a professional level and in cooperation with great observatories in several parts of the world, obtaining excelent results. Its construction itself is an extraordinary result, from the optical to the mechanical point of view, In fact the entire structure, from the dome to the telescope, has been integrally self made. 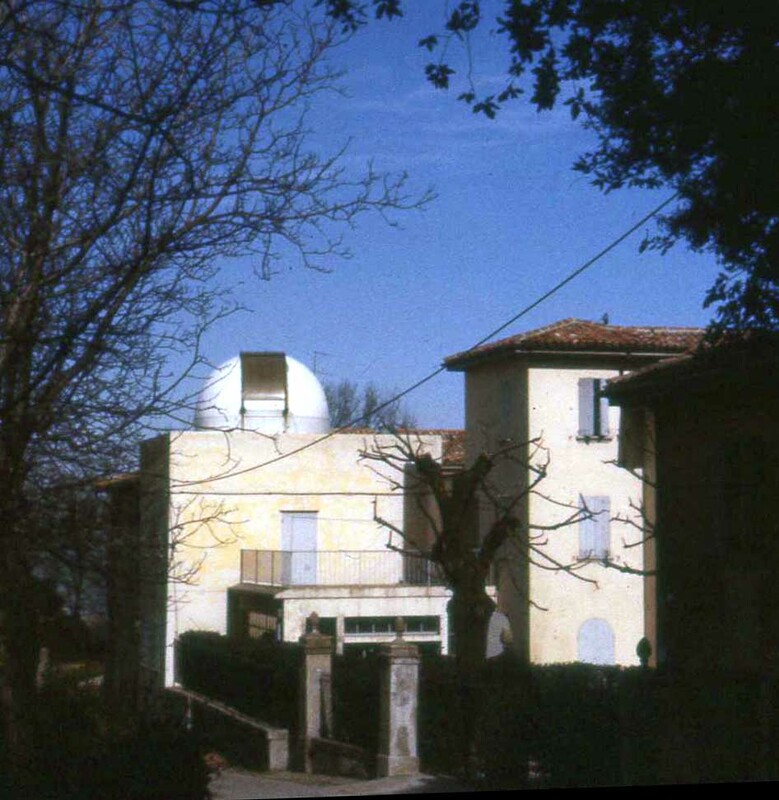 The idea to construct the observatory came to Ciro Vacchi in early 60's. He succeeded in involving Giorgio Sassi and also Giancarlo Sette, already in contact with Sassi in the construction of the Margherita Garden observatory. The project started in the mid sixties. Vacchi was the owner of the building on whose terrace the dome was constructed. The underlying rooms were used for the services of the observatory, in particular the first floor was used for mechanical workshop with numerous tools, like a great lathe, a mirror making machine, able to grind mirrors to a diameter of 50 cm and a vacuum chamber to evaporate aluminium on the mirror. The second floor was partially used as a darkroom and partially as a library as well a location of the auxiliary equipments for the analysis of the film. 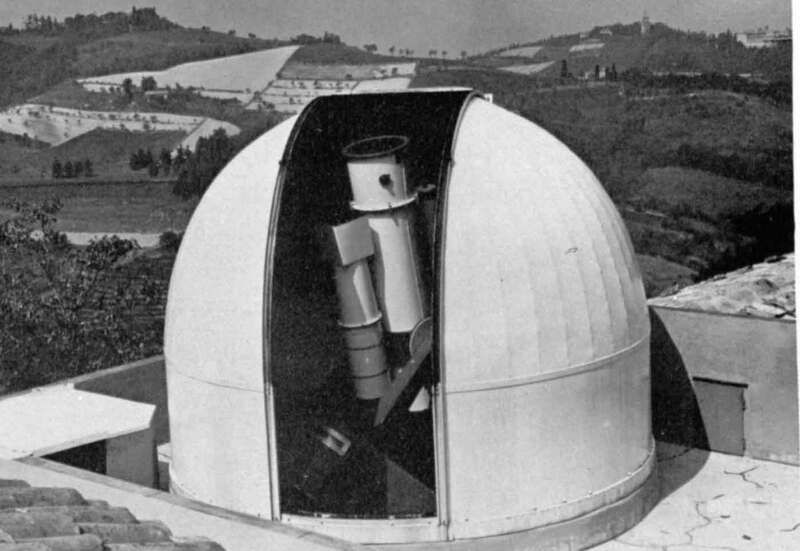 After some years of constant and daily work and the solution of a myriad of problems, the observatory became functional in 1969. They had made a hemispherical dome of 4 m in diameter that contained, a reflector telescope of 45 cm with ability of double configuration, newton or cassegrain, on equatorial fork mount. In the newton configuration there was the possibility to work to direct focus, f5. In cassegrain mode, the instrument, by changing the hyperbolic mirror, was able to obtain a focal equivalent of 11,5, 40 and 45,7 meters, that rendered it particularly useful for planetary photography. 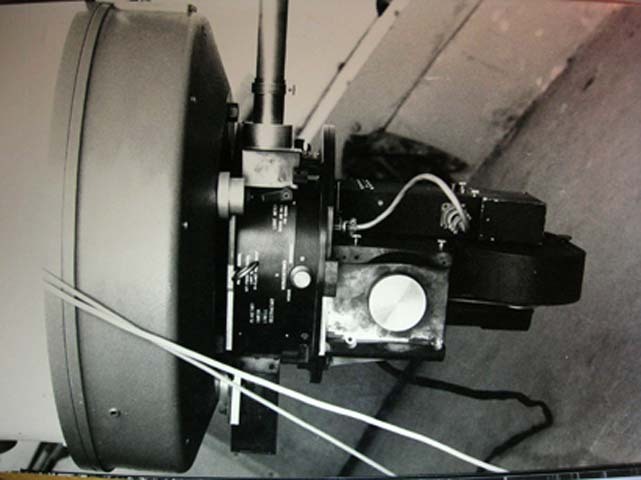 In parallel to the main instrument, they mounted a refractor of 15 cm for guiding and a Goerz-Dogmar astrograph with an objective of 11 cm, focal ratio 4,5, replaced, some time later, with a Schmidt camera of 25-32-60 cm. The auxiliary instruments, also fully designed and built by Sassi and Vacchi in their mechanical optical laboratory, included, among other things, two blink comparators and two plates meter with micrometric screw. Since the beginning of its activity, the observatory mostly dealt with planetary photography, and for the occasion of the great Mars opposition in summer 1971 the team took hundreds of photographs of the planet. Sette's contribution was precious to the knoledge regarding emulsions, filters and film developing. This work was used by Luigi Pansecchi for his publication and therefore became well known in professional environments. For this reason in 1975 the observatory was contacted by the Lowell Obsrvatory in order to participate in the International Planetary Patrol Program, a program of planetary surveillance financed by NASA in which others observatories partecipated like the Haway, Cerro Tololo, and Perth. The campaigns of observation proceeded till 1981 and not only the planet Mars was involved but also Jupiter and Saturn. 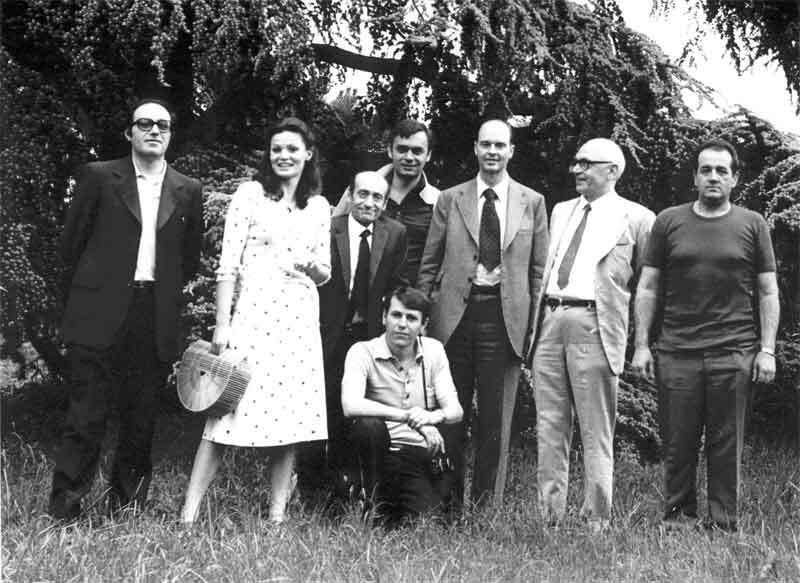 The program target was to continually observe some planets to find any variation on their surface or in their atmosphere, through a network of observatories distributed on the whole terrestrial surface. The job was hard and demanding, since it had to be carried out every day it was possible. In the 1978 William Baum, of the Lowell observatory, director of the program, came to visit Saint Vittore (see photo). After the campaign of 80-81 the program was cancelled due to a reduction of the funds to NASA decided by the American government. With the members of the group however remained the great satisfaction and acknowledgment of their professionality and to have worked at par with observatories of international prestige. 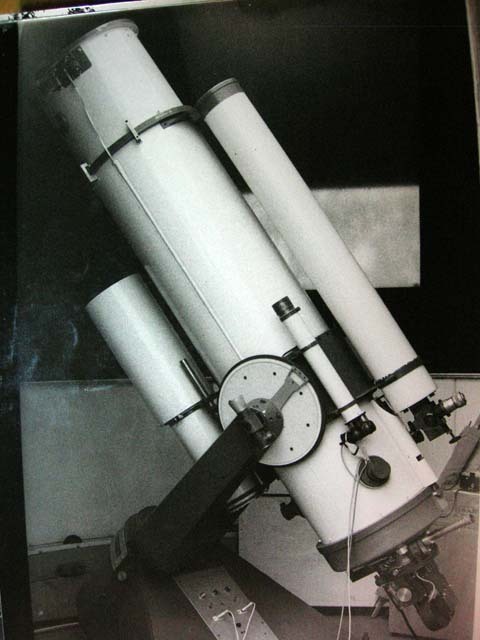 Later on, the activity of the observatory was oriented towards the observation of the minor planets, thanks to the contribution of Vittorio Goretti and Ermes Colombini. The job consisted in researching minor planets whose orbits were determined with deficient precision or that had not been observed for a long time, in order to obtain new and more accurate coordinates, and gain the definitive orbit. They photographed the zone of sky, where the minor planet was supposed to be found (these indications were obtained from the volume “Ephemerides of Minor Planets”), twice the same zone after an interval of 30 minuts, the films were passed to the blink in order to find the planet and finally to the film meter in order to gain the coordinates comparing the background stars. With a complex mathematical calculation, for which a computer HP-85 was used, the coordinates were converted in right ascension and declination. Then the coordinates obtained were sent to the Minor Planets Center, at the Smithsonian Astrophisical Observatory, where Saint Vittore observatory was known by number 552. Sometime while tracking minor planets new ones are found, and in fact this happened several times. the first planet discovered in Saint Vittore dated to 1979 was called “Vittore”, the following year was discovered “Bologna” and later many others reaching more than 90 new minor planets. Today Saint Vittore Observatory is definitively closed. Its closed not because it could'nt work anymore but because there was nobody to manage it. Vacchi died at the end of the 90's, Sassi and Sette are really old men and can no longer work in continuative activities. Goretti is retired, some others decided to follow other paths and thus after nearly forty years of profitable activity, the structure had to close. And the amateur astronomers of Margherita Garden? We must unfortunately admit not to possess the same ability as those who have preceded us, a thing is to spend some nights in the observatory, two or three times a week, it's another thing to work full time, in order to carry out a serious activity of astronomical research, going ahead step by step with constant everyday work. Now we are really sad because we have lost something of such great value, that will be hard to find again, because the excellence of the results is not only the fruit of high quality instruments as many people today thought, but, above all, the importance of dedication and hard work.